Using the picture book ‘What Friends Do Best’ by Jonathan Emmett and Nathan Reed to explore how working together is sometimes the only way to get things done. KEY QUESTION: Why do we work together? The school system increasingly recognises and rewards individual achievements. Sometimes however, there are things that are much harder to achieve working alone than they are if working together with others. This picture book looks at this through a gentle story about three friends. It allows an opportunity to talk about these things and is especially suited to younger learners. It could also form the basis of an assembly. 1. 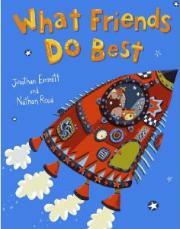 Read the book ‘What Friends Do Best’ by Jonathan Emmett and Nathan Reed out aloud. Give learners a chance to look at the pictures as well as listen to the words. How does each character in the story approach the situation and why might their reactions be different. Why do you think Winston reacts in the way he does? What is the story trying to tell us about working together? What is the story trying to tell us about individual qualities or achievements? Does working together with others stop us being special? Is it always best to work together or are we sometimes better to work alone? Are there sometimes things that get in the way of people living or working together?